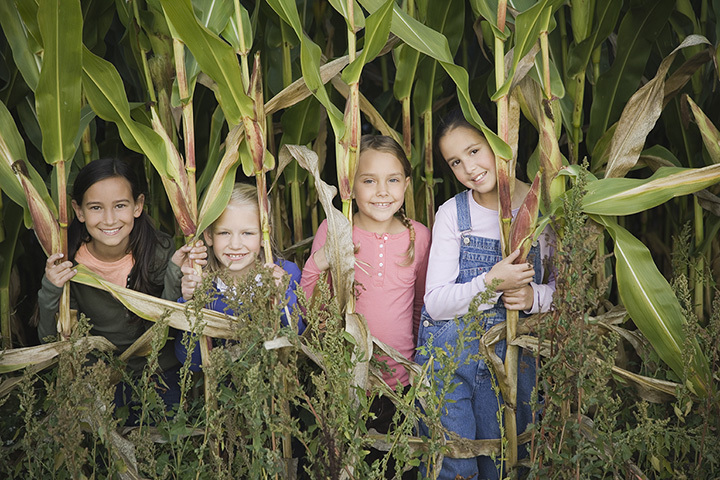 Welcome the fall season the right way: By exploring a corn maze! In Missouri, these beautiful crop labyrinths are intricately designed and fun for the whole family. These are wonderful community events, a great way to support local farms, and most important, are a day of exciting fun! Here are the best corn mazes in the Show Me State. Home of that famous gumball coaster, the Shyrock family (who has been farming in Northern Callaway County since 1889) began inviting visitors to the farm back in 2002. Start making plans now to enjoy being in the country while you experience this life-size corn maze. In addition to having one of the best corn mazes in Missouri, this spot also features group hayrides, pumpkins, and roaring campfires. “It’s just more fun here” is an appropriate motto for this amazing corn maze in Exeter! The eight-acre Exeter Corn Maze is packed with fun and adventure that will keep your family busy day and night. The Exeter Corn Maze features a 50-acre pumpkin patch, zip line, haunted barn and maze, zombie paintball, petting zoo, hayrides, and much more! Getting lost between these giant stalks of corn is fun the whole family will enjoy. No one does corn mazes like the Fun Farm Pumpkin Patch in Kearney. This fun farm uses state-of-the-art technology to cut intricate designs out of its giant corn field. From haunted mazes, bonfires, and scavenger hunts to hayrides, karaoke, and pumpkins, there’s something for everyone at the annual fall celebration down on Campbell’s farm. That’s not all, of course! Campbell’s Maze Daze also features one of the best corn mazes in Missouri. It’s all good farmin’ fun and fright for the entire family down on the farm at the popular Verona MAiZE. This labyrinth is carved into a seven-acre corn field and is operated by GRIP Boys Home as a fundraiser. Designed to challenge the wits of maze-goers, it takes an average of 45 minutes to find the one exit through over two miles of twists, turns, and dead ends. Liberty Corn Maze consistently ranks among the best in the state. In past years, they’ve done election-themed designs, Kansas City Royals-themed creations, and a tribute to the National World War II Museum. One of the largest corn mazes in the St. Louis area, the Corn Maze at Brookdale is the place to be for outdoor fall fun. If you’re feeling brave, see if you can make it through over 100 acres of terror at this spot’s haunted maze and hayride. View more Missouri Corn Mazes.